After helping create Canada’s first microbrewery in Horseshoe Bay, BC, Frank Appleton returned to his home in the Kootenays but soon found himself in demand as a consultant brewmaster. Over the next two decades, he would help start up more than a dozen other breweries around the world, including Swans Brewpub, Yaletown Brewing, Nelson Brewing, and several others in BC, as well as Deschutes Brewing in Bend, Ore., and the Ninkasi Ale House in Lyon, France. 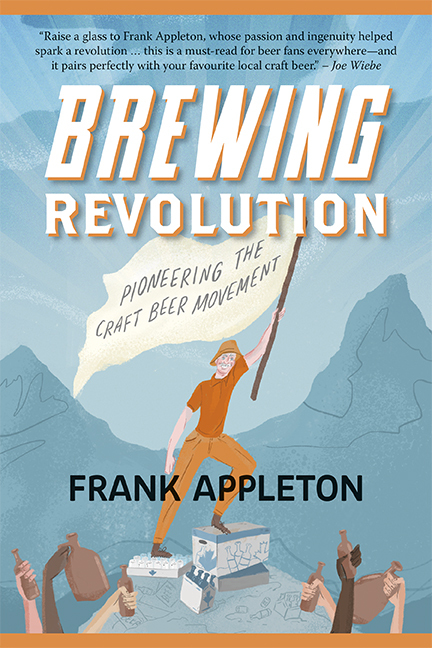 Appleton has since been honoured with a Lifetime Achievement Award for leadership in craft brewing from CAMRA Victoria and published a memoir about his life in the beer industry entitled Brewing Revolution. Following Appleton’s departure from BC, John Mitchell joined forces with a young architect named Paul Hadfield to build Canada’s first brewpub, Spinnakers, in Victoria. At the time, federal excise tax law did not allow beer to be brewed and sold under the same roof, so the idea of a “brewpub” was not technically legal. Leading up to Spinnakers’ opening in May 1984, Hadfield and Mitchell joked that they might have to brew the beer, put it in kegs, then take it out one door, drive it around the block and bring it back in another door just to prove a point. But shortly before opening, their lobbying efforts succeeded and the laws were changed to allow it. 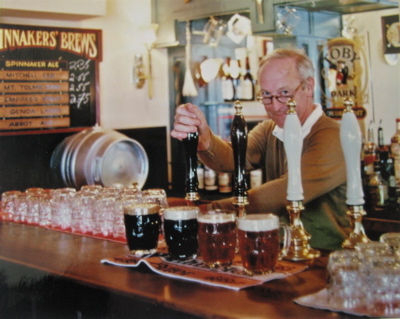 John Mitchell behind the taps at Spinnakers Brewpub in 1984. Spinnakers has been operating continuously ever since under the guidance of Paul Hadfield, who would become its publican. Over the years, the business has expanded considerably and added several neighbouring guest houses. Today, the brewpub produces cider along with a wide range of craft beers and works closely with local farmers and meat and seafood producers. In November 2016, many Victoria residents were shocked when Spinnakers was damaged by a fire that started in the chimney in the upstairs pub. Happily, the building was saved by firefighters and restoration was completed in early 2017. 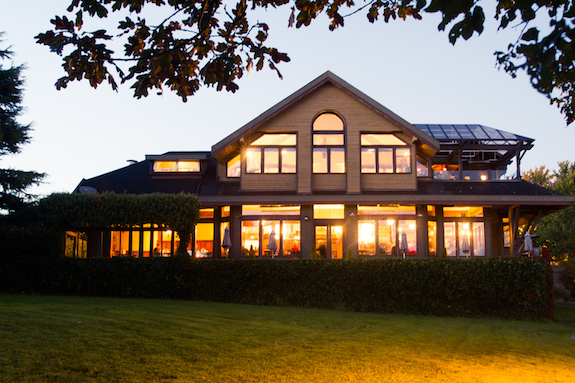 Following the fire at Spinnakers, Canada’s original brewpub is better than ever. Two other breweries opened in British Columbia the same year as Spinnakers: Granville Island Brewing in Vancouver and Island Pacific Brewing in Saanichton, near Victoria. The latter eventually changed its name to Vancouver Island Brewing and moved downtown. Okanagan Spring Brewery opened in Vernon, BC in 1985. Together with Spinnakers, these breweries played significant roles in introducing “microbrew” to their regions. By 1991, there were a few more pioneer breweries on the scene, including Shaftebury Brewing (Vancouver), Swans Brewpub (Victoria), Whistler Brewing and Nelson Brewing. 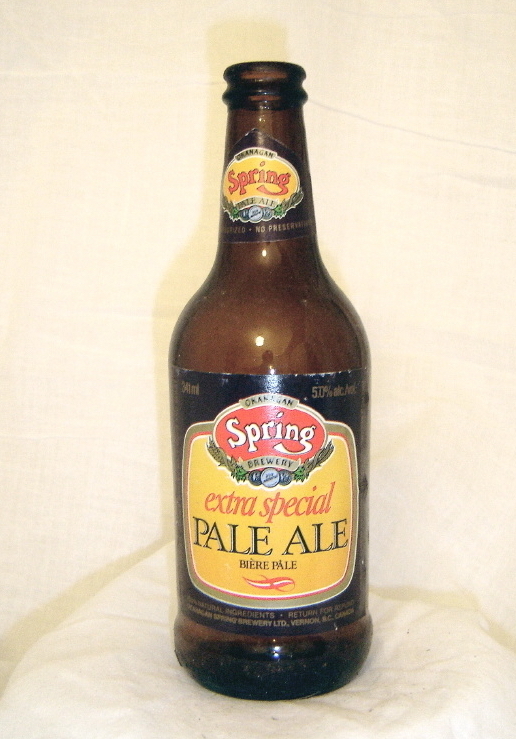 In the late 1980s and early 1990s, Okanagan Spring Pale Ale was the most popular craft beer in BC. During the 1990s, the microbrewery movement expanded across BC, with breweries opening in the Okanagan, Kamloops, Revelstoke, the Gulf Islands and the Lower Mainland. John Mitchell and Frank Appleton teamed up again to help design and build Howe Sound Brewing in Squamish, which remains Mitchell’s “local” to this day. There was a mini brewery boom in Vancouver — where Yaletown Brewing, Steamworks Brewpub, Storm Brewing, Dockside Brewing, R&B Brewing and Dix BBQ & Brewery all opened — and a couple of major beer festivals began then that are still going strong today: the Great Canadian Beer Festival in Victoria and the Okanagan Fest-of-Ale in Penticton. Fun times at the Great Canadian Beer Festival in Victoria. By 2000 there were 25 craft breweries in British Columbia — although the term “craft beer” still wasn’t in common usage. That number continued to grow over the subsequent decade, which saw the birth of several small breweries that have since grown into major operations: Phillips Brewing (2001), Central City Brewing (2003), Fernie Brewing (2003), Red Truck Beer (2005) and Driftwood Brewery (2008). Beyond the breweries themselves, a few other important things were beginning to happen. First of all, some of BC’s private liquor stores, which were originally known as “cold beer and wine stores” when they were first allowed in the 1990s, began stocking beers that were not available in the government-operated stores, and often sought out breweries from the U.S. or Europe. This was the start of what is now a flourishing network of “bottle shops,” which provide an alternative retail model for smaller craft breweries that cannot produce enough beer to supply the government stores’ minimum requirements. The arrival of American craft beer from places like Seattle, Portland and California, as well as unique beers from Belgium and Germany, also inspired BC brewers to “up their game” to produce beer that was just as good, if not better. 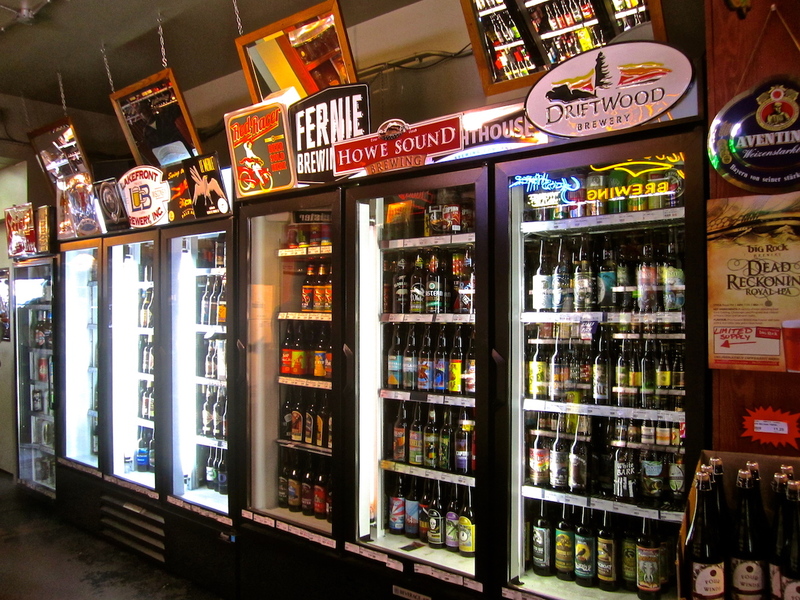 Fridges filled with bottles at the Brewery Creek liquor store in Vancouver. Hand in hand with this development was the “tap house” model, which was first popularized at the Alibi Room in Vancouver from 2006. By putting multiple beers on tap in one place and rotating through new styles on a constant basis, the Alibi Room became the province’s “craft beer headquarters.” BC brewers considered it an honour to be put on tap there, which created a friendly sort of competition to brew beer good enough to make the cut. Other tap houses followed suit, and now they can be found in communities throughout BC. 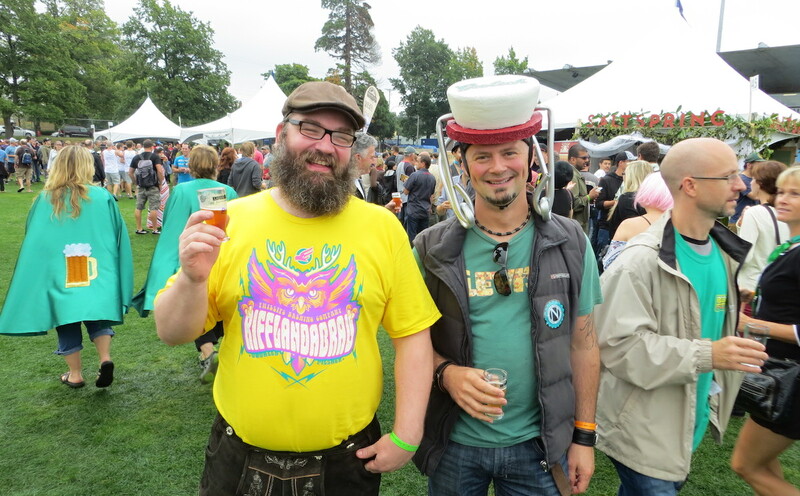 Cask-conditioned beer also grew in popularity thanks to the efforts of organizations like CAMRA Vancouver, which produced seasonal cask festivals. Not only was this a good way to introduce consumers to unique styles of beer, but it also gave breweries the opportunity to experiment and expand their repertoires. By 2010 there were about 40 craft breweries in BC. Growth in the industry had been steady for a while. But that was all about to change and no one could have predicted what was about to happen.